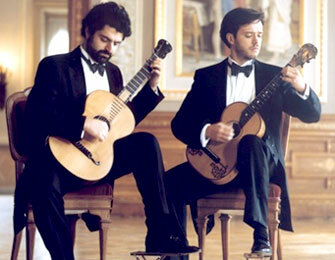 The first concert in the 2007 Charles Darwin University Concert Series will feature renowned Italian duo, Claudio Maccari and Paolo Pugliese on authentic 19th century guitars. Claudio and Paolo, who will perform works by Giuliani, Sor and Coste, are in Darwin as part of their Australian tour which includes Brisbane, Sydney and Hobart. Claudio and Paolo started their studies and research into 19th century music in 1988. Since then they have been exploring new possibilities in the performance of the music of the classic and romantic periods using original instruments and historical methods. Both have given concerts and master classes at leading universities and major festivals throughout the world, including the Darwin International Guitar Festival. They also teach 19th century guitar at the Accademia Internazionale della Musica (International Academy of Music) in Milan. With dynamic performances and refined ensemble playing, Claudio Maccari and Paolo Pugliese are a favourite with audiences wherever they perform, and are one of the worlds’ leading guitar ensembles—not only breaking new ground in the music they present but also in their virtuosic and thoroughly entertaining approach to ensemble playing. The concert will be held Friday 23 March at 8pm at the CDU Theatre. Doors open at 7.30pm and tickets are priced at Adults $20, Concession $12, U3A members $10 and Children $8. Tickets will be available at the venue on the night. For more information contact 8946 6419.